This workflow is for software license administrators or software users—either may authorize a Single Use license. Commonly, the software license administrator provides the user with an authorization number or a provisioning file and the user completes the authorization process. To authorize a Single Use license, you start ArcGIS Pro, so the application must already be installed on your machine. You need to know which ArcGIS Pro license level (Basic, Standard, or Advanced) and which extensions, if any, you will be authorizing. You need authorization numbers for ArcGIS Pro and each extension, or you need a provisioning file. At the bottom of the ArcGIS Sign In page, click Configure your licensing options. The Licensing dialog box appears. If you bypass the ArcGIS Sign In page, click Settings in the lower left corner of the ArcGIS Pro start page. In the options on the left side of the application, click Licensing. 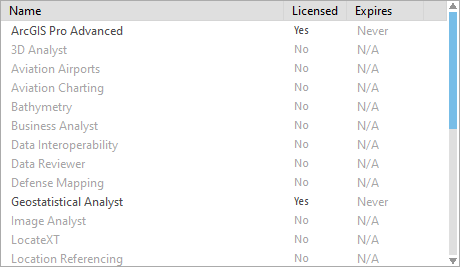 On the Licensing page, click Configure your licensing options. On the Licensing dialog box, click the License Type drop-down menu and click Single Use License. Under License Level, click the license level you will use: Advanced, Standard, or Basic. In this example, an Advanced license level is selected. Click Authorize to open the Software Authorization Wizard dialog box. If you do not have a provisioning file, on the Authorization Options page, under Authorization Options, accept the default option I have installed my software and need to authorize it and click Next. If you have a provisioning file, click the option I have received an authorization file and am now ready to finish the authorization process, click Browse, and browse to the location of the .prvc file (for example, your Downloads folder). See Provisioning files for more information. On the Authorization method page, accept the default option Authorize with Esri now using the Internet and click Next. If you don’t currently have Internet access, click Authorize at Esri’s website or by email to receive your authorization file and follow the prompts to fill out the form and save it as a text file. See Authorization files for information on how to complete the process. On the Authorization Information page, confirm that your contact information is correct and click Next. On the Authorization Information (continued) page, confirm that your organization, industry, and job description are correct and click Next. On the Software Authorization Number page, provide your license number. On the Authorize Software Extensions page, accept the default option I do not want to authorize any extensions at this time. If you want to authorize extensions, click the option I have authorization number(s) to authorize one or more extensions. Under Extensions, provide the authorization numbers for the extensions you want to authorize. See the Authorize an extension section below for more information. Click Next to start the authorization process. When the process finishes, a message on the Software Authorization Wizard dialog box informs you that your software has been authorized and is ready for use. The ArcGIS Pro Licensing dialog box remains open. In the list of products, ArcGIS Pro is now licensed. On the Licensing dialog box, click OK.
ArcGIS Pro opens and is ready to use. If you were previously signed in to ArcGIS Pro with a different license type, such as a Named User license, you will be prompted to close and restart the application for the license change to take effect. In the upper right corner of the application, notice that you are not signed in. You do not need to sign in to use the application and there is no licensing portal. Signing in to an active portal is necessary, however, to exchange content between ArcGIS Pro and ArcGIS Online or ArcGIS Enterprise. You may need to authorize one or more extensions after ArcGIS Pro has been authorized. First, you will need to convert one or more Named User licenses for the extension product in My Esri. Follow the same process you used to convert core product licenses as described in Convert Named User licenses to Single Use. Once you have the authorization number, proceed with the steps below. The workflow is similar to authorizing the core product. In the options on the left side of the application, click Licensing. 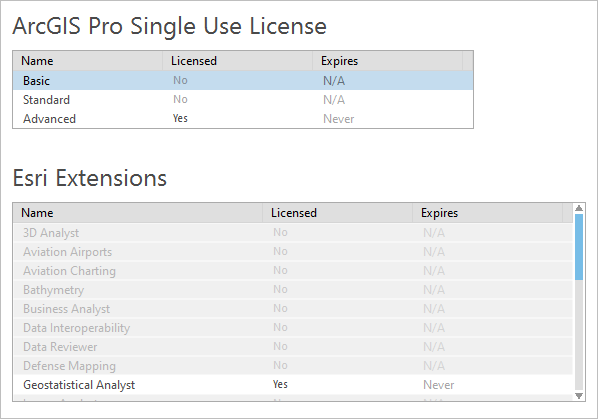 On the Licensing page, click Configure your licensing options. 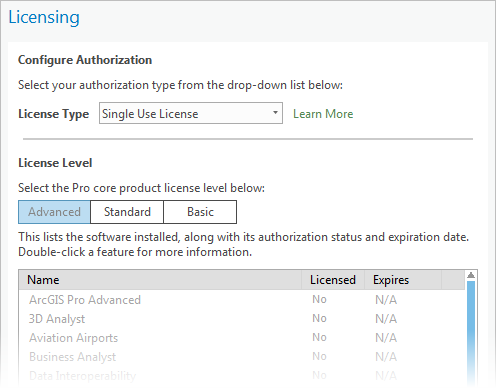 On the Licensing dialog box, click Authorize to open the Software Authorization Wizard. On the Authorization Options page, select the option I have already authorized the software and need to authorize additional extensions and click Next. On the Authorize Software Extensions page, click the extension you are authorizing and provide the authorization number. When the process finishes, a message in the Software Authorization Wizard confirms that your software has been authorized and is ready for use. The ArcGIS Pro Licensing dialog box remains open. In the list of products, the extension is now authorized. At any time, you can view your license information, including your license level and the extensions you are authorized to use. Start ArcGIS Pro if necessary. On the ArcGIS Pro start page, click Settings in the lower left corner of the application window. Alternatively, if you are working in a project, click the Project tab on the ribbon. Click the Back button in the upper left corner of the application window or press Esc to return to the ArcGIS Pro start page or to your open project. With a Single Use license, you are not connected to a licensing portal (as you are with a Named User license) or to a license server (as you are with a Concurrent Use license). There is no need to authorize ArcGIS Pro to work offline.